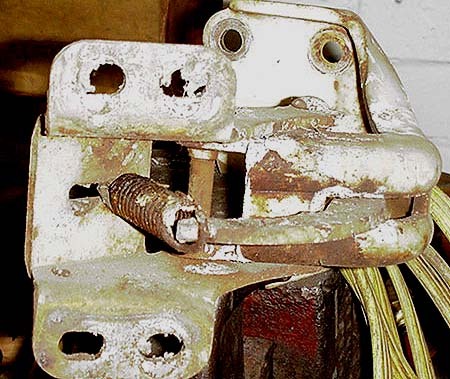 On the 65 and 66 Chryslers, I've been having a problem with the "door keeper" mechanism. When you open the door, the "door keeper" is supposed to hold the door at the mid way position and at the full open position. After the door has been opened and closed a few squazillion times, the keeper doesn't want to work and I decided to find out why. 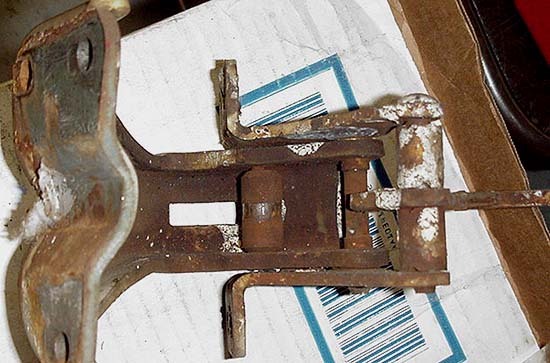 The hinge in the pictures has been removed from a parts car passenger side door. The driver's door is similar, and likely to show more wear since it gets more use. 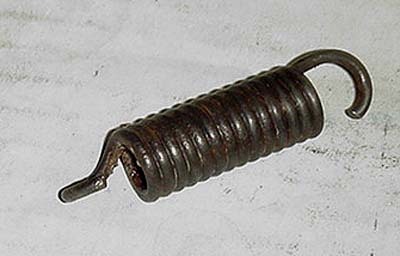 The "door keeper" consists of a roller, a spring, and a follower lever. 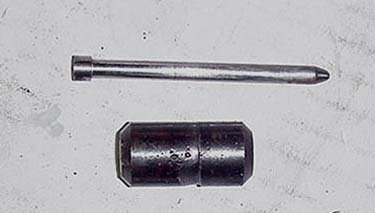 In this photo you can see the spring and the follower lever. The roller is hidden. A closer view of the spring and follower. A view with the spring removed. You can see the inside profile of the follower lever and the detents for holding the door at the midway and full open positions. This view is from the hinge from the back side. You can see the roller. A view of the back side again, this time with the follower lever moved to show the roller. At the top of the roller you can see the pin that retains the roller. 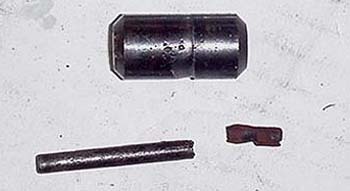 And here is the cause of the problem, the broken pin. On this door, the pin broke at the bottom, either from rust or old age. 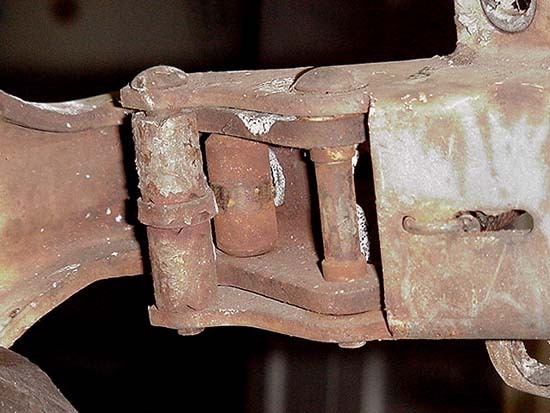 This allowed the roller to bend away from the follower lever and this resulted in less spring pressure to hold the roller and follower together in the detents. A closer view of the roller and you can see that the groove has worn at an angle. This is because the pin was broken and let the roller run at an angle. 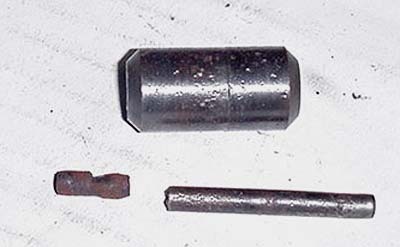 The original pin was a standard 3/16" roll pin. I made a new solid steel pin at .187" diameter 2.5" long. 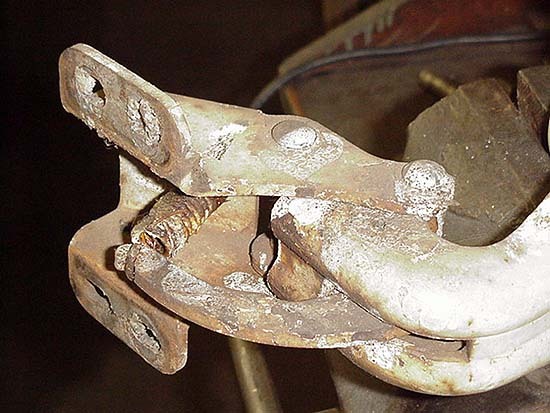 Working with the hinge on the car, access is limited and it is not easy to install the pieces. It is particularly frustrating to reinstall the spring but it can be done. I used a stout Phillips screw driver to work the spring onto its seat but it took a dozen or so attempts before it worked. And of course I chipped the paint. Here are pictures of the spring. 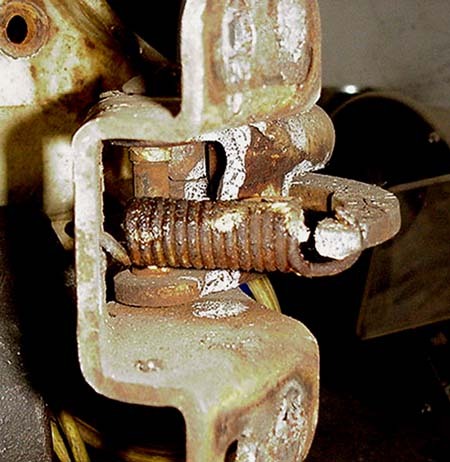 Initially I thought the reason the keepers didn't work was because the spring had lost tension. I swapped replacement springs from the passenger side and had no improvement, and that was when I found the roller issue. 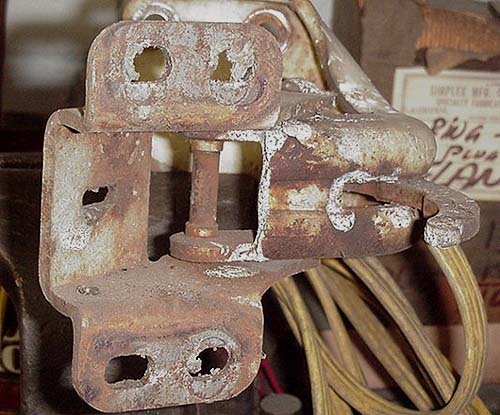 While checking on springs, I consulted a spring manufacturer and was told that unless the spring has visible damage, it will probably never lose tension. Note the tight coils on the spring. This is known as a "high initial tension" style spring, common to this application and very expensive to reproduce in small quantities.